On a recent trip to Black Rock Oregon, the NSMBA bumped into some familiar faces. Thomas Vanderham, Geoff Gulevich, Andrew Shandro and Darcy Turrene were savouring the trails while shooting the upcoming Dakine 2010 catalogue with Sterling Lorence. 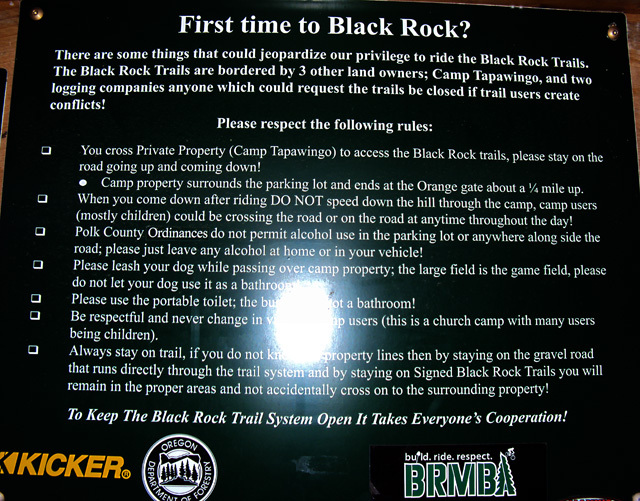 Black Rock is a tremendous trail network that exists through respectful relations with three different landowners, and is located on State Land. The BRMBA has a code of building standards that is reflected in the quality of workmanship on all trail features and adds to the trail users experience ensuring the builds are predictable and solid. It is a great example of conscientious relations, building practices and diplomacy that has resulted in one of America's greatest 'Secret Stashes', as dubbed in BIKE magazine's July 2009 issue. As the BRMBA continues to further relations with landowners, all riders are asked to adhere to a code of conduct. This improves positive relations and opens opportunities for future development and acceptance. Just like the trails on the North Shore, cooperation is a key component to ensure longevity and solidify the network's future.